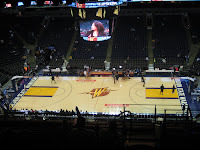 On Wednesday night a couple of buddies and I attended the Warriors vs. Kings game. We had a good time ("It's A Great Time Out!" site here). Had a beer. Crowd was into it. Unfortunately the Warriors lost...IN TRIPLE OVERTIME! The final score was 135-133. It was the Warriors' first triple-overtime game since a 115-109 victory over New Orleans on Nov. 23, 2004.